Background: Preterm birth (birth before 37 weeks of gestation) is a major problem in obstetrics and affects an estimated 15 million pregnancies worldwide annually. A history of previous preterm birth is the strongest risk factor for preterm birth, and recurrent spontaneous preterm birth affects more than 2.5 million pregnancies each year. A recent meta-analysis showed possible benefits of the use of low dose aspirin in the prevention of recurrent spontaneous preterm birth. We will assess the (cost-)effectiveness of low dose aspirin in comparison with placebo in the prevention of recurrent spontaneous preterm birth in a randomized clinical trial. Methods/design: Women with a singleton pregnancy and a history of spontaneous preterm birth in a singleton pregnancy (22-37 weeks of gestation) will be asked to participate in a multicenter, randomized, double blinded, placebo controlled trial. Women will be randomized to low dose aspirin (80 mg once daily) or placebo, initiated from 8 to 16 weeks up to maximal 36 weeks of gestation. The primary outcome measure will be preterm birth, defined as birth at a gestational age (GA) < 37 weeks. Secondary outcomes will be a composite of adverse neonatal outcome and maternal outcomes, including subgroups of prematurity, as well as intrauterine growth restriction (IUGR) and costs from a healthcare perspective. Preterm birth will be analyzed as a group, as well as separately for spontaneous or indicated onset. Analysis will be performed by intention to treat. In total, 406 pregnant women have to be randomized to show a reduction of 35% in preterm birth from 36 to 23%. If aspirin is effective in preventing preterm birth, we expect that there will be cost savings, because of the low costs of aspirin. To evaluate this, a cost-effectiveness analysis will be performed comparing preventive treatment with aspirin with placebo. 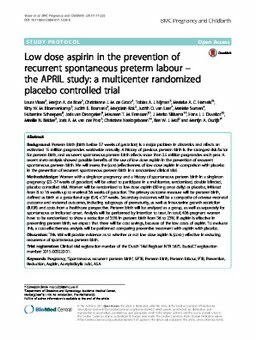 Discussion: This trial will provide evidence as to whether or not low dose aspirin is (cost-) effective in reducing recurrence of spontaneous preterm birth. Trial registration: Clinical trial registration number of the Dutch Trial Register: NTR 5675. EudraCT-registration number: 2015-003220-31.